Scotch Wool & Hosiery Stores, St Annes. no.11, Garden Street, St Annes. 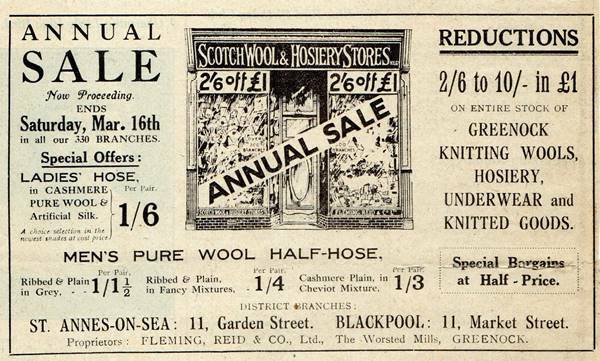 Advert for the Scotch Wool & Hosiery Stores, 11, Garden Street, St Annes and 11, Market Street, Blackpool, March, 1929. Proprieters: Flemming, Reid & Co., Ltd, The Worsted Mills, Grenock. This shop was "Pickles Farm Foods" for several years and is now (2017) "St. Anne's Fine Foods."